This chapter covers a few important recommendations you should pay attention to before you begin entering data into the Catalogs in XpertMart™. The data entry can be a lengthy process so it is worth planning ahead to avoid complications down the road. The time you spend entering data in the beginning will pay off later when you run reports and have a wealth of information to help you make better decisions. Before you begin, you should read the Catalogs topic to understand the basic layout of a catalog and the functioning of the toolbar. Before you make any transaction, be sure you have opened every catalog at least once, even if you do not enter any data into the catalog. 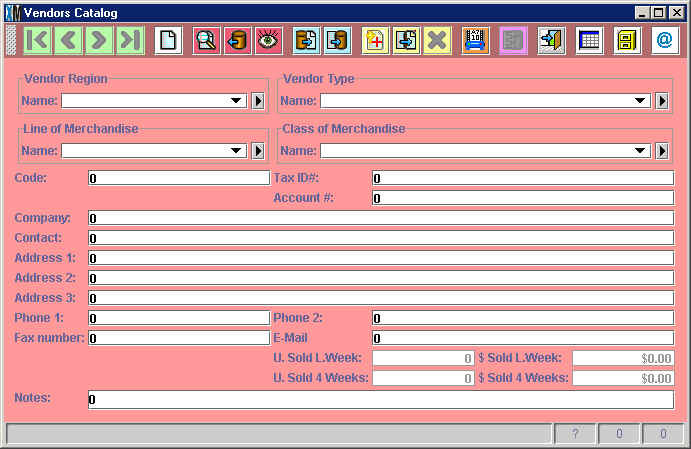 When you open a catalog for the first time, XpertMart™ is in fact creating the table for that catalog in the database. Some transaction windows will not open if the proper database table does not exist. For example, if you have never opened the Transportation Catalog, the Out Slip transaction screen will not open. Similarly, if you have not opened the Vendor Terms catalog, the Receipt transaction screen will not open. Your safest bet then, is to open every catalog once, even if you don't add any records. This means there are no records currently in the catalog. It is very important that you do not start entering data in the catalog before you press the New Record Button . Otherwise you run the risk of saving this information in the "zero" virtual record which could creat problems down the road. If you have accidentally started entering data, and then press the New Record Button, be sure to answer <NO> when XpertMart™ asks if you want to save your changes, or just close the catalog. Press <OK> and then press the New Records Button to start again. You will lose the information you have entered. When you are entering data into a catalog, you will notice that the names of some fields appear in red. These are the fields that must be filled out for XpertMart™ to function properly; every other field is optional. 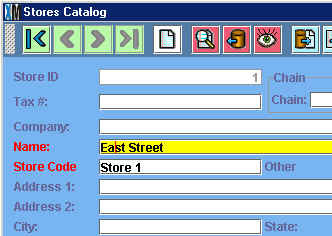 In the image below, taken from the Stores Catalog, only the Name and Store Code field are required; every other field can be left blank. However, filling in other fields is recommended since they can enhance the kind of analysis you can do. If you do not classify the Chain a store belongs to, then you will not be able to compare the relative profitability of your chains of stores, for example. The ulitmate decision is left to the discretion of every user. In several catalogs you will notice that there is a Code field which is an optional field in every catalog, except for the Stores Catalog (where the Store Code field is used to populate the XpertMatrix™). The Code field (shown below) is there so that users of legacy systems that required the use of codes can import those codes into XpertMart™. However, becuse XpertMart™ runs on a relational database and because there is no limit to the number of characters in any field, there really is no need to use codes in the system anymore. Therefore, the Code field can safely be ignored by the majority of users. The image above is taken from the Sizes Catalog, which is an example of a catalog where entering a size code is really not necessary. The information you enter into a catalog in XpertMart™ is case-sensitive. Keep this in mind if you are thinking of entering information using all upper-case or all lower-case. 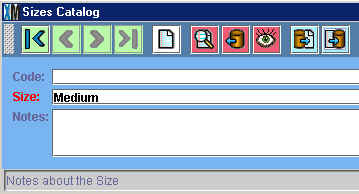 Finally, as you enter information into catalogs, it is very important that you never erase a record in a catalog that has already been used in another catalog: for example, if you have created a certain size in the Sizes Catalog and that size has already been referenced by an item in the Items Catalog. Otherwise the integrity of the database could be compromised. If you have any doubts, contact your XpertMart™ Distributor for help. Similarly, if you accidently duplicate a record in a catalog, the safest thing is to rename that record rather than delete it. Later on you will need to fill in the POS and Documents Catalogs as you get ready to enter transactions. You may also want to enter data into the Vendor Regions, Vendor Terms and Vendor Types catalogs; as well as the Store Regions, Store Chains and Store Types catalogs. * For each of these, make sure that the "Manual Use" checkbox is checked. More than likely these catalogs will already have the proper entries when you install XpertMart™. However, be sure to double-check to avoid any problems down the road.